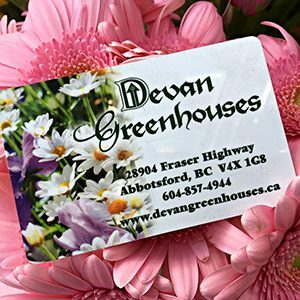 Devan Greenhouses started out in 1993 as a small family run greenhouse located in Chilliwack, BC. Since then then we moved to Abbotsford and built a fully glass greenhouse that has grown to 30,000 square metres and includes a garden centre that carries everything for your gardening needs! We pride ourselves in growing most of our annuals and bedding plants. The rest of our 3,200 square metre garden centre is taken up by a large selection of houseplants, herbs, vegetables, seeds, bulbs, shrubs, perennials, trees, décor, and gardening tools. Bring the whole family for a visit to our petting zoo and make your visit a family event. Sign up for our newsletter at www.devangh.ca or follow us on Facebook for the latest news and events. Open: Feb-Oct Mon-Sat 9:00am-6:00pm; open late until 8:30pm Mon-Fri in May; regular hours on Saturdays. See our website for up-to-date information and opening hours.